Dentsu Jayme Syfu Philippines has a whole new way of redefining women power. For women’s month, it launched a campaign that presented how women feel about themselves, in a totally contrasting way. All 63 female employees decided to proudly and unapologetically declare their imperfections on social media. It was refreshing to see women, celebrating themselves in the most honest way possible and bravely sharing them. Instead of finding faults, feeling guilty or being ashamed, they proudly embraced them. Two “imperfect and proud” women from the agency were posted every day. One declared her “loud” nature, which simply showed that her “volume” matches her “passion”. While another admitted that her “snobbish” persona was simply her way of trying to be effortlessly cool, and an excuse for her to make small talk with strangers. The agency’s previous #sistergood campaign featured women supporting other women to push leadership in the workplace. It dealt with issues from sexual preference to single motherhood. With a commitment to help working moms, it also launched several initiatives that year. Maternity leave was extended and mothers (even fathers) were allowed to bring their children to work. 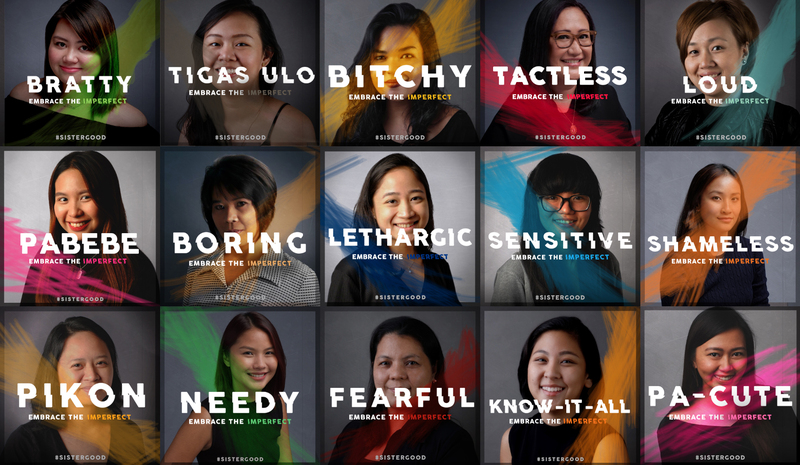 With this year’s effort, the women of Dentsu Jayme Syfu had just shown the world that they are not all ashamed of their true selves: the “know-it-all”, “difficult”, “tactless”, “bratty” or even “bitchy”. Now that’s imperfect.